Salvia darcyi (or Salvia oresbia) is commonly called Darcy's sage, Mexican sage, Red Mountain sage, Fiery sage and Galena red sage. Salvia darcyi is a perennial to deciduous shrub, depending on the climate. This drought-tolerant plant has showy spikes of brilliant red flowers that are much loved by hummingbirds. Salvia darcyi reportedly was discovered by plant nursery collectors near Galena, Mexico, in 1988. A 1991 British expedition into northern Mexico found it growing in a rocky limestone ravine 9,000 feet high in the Sierra Madre Oriental mountain range. The plant originally was called Salvia oresbia, but in a 1994 issue of Kew, the magazine of the Royal Botanical gardens in Kew, England, James Compton renamed it after John d’Arcy, a member of the British collecting team. It is often still called Salvia oresbia. Salvia darcyi grows to 20 to 30 inches wide and 35 to 40 inches tall. It spreads by stolons, runners that creep along the ground and grow into wide, dense clumps. The plant's sticky, pastel-green leaves are triangular or heart shaped. In the winter, Salvia darcyi will die back to its rootstock; it grows rapidly in the spring and responds to frequent pruning to shape its branches. Salvia darcyi is a good choice for the middle of a garden but is less well-suited for a border; its sticky leaves can easily break off and stick to the clothes of passersby. This plant also grows happily in large pots or containers on a patio. 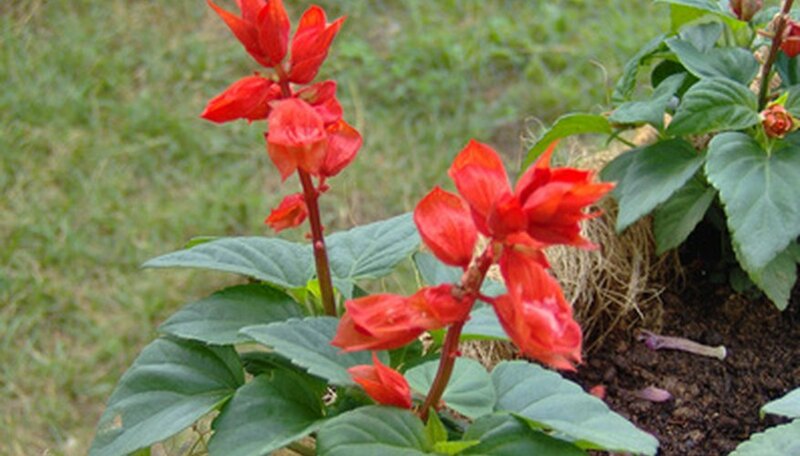 In early spring to later summer, Salvia darcyi produces spectacular whorls of cardinal-red flowers that grow in dense clusters on long spikes above the foliage. It is often grown to attract hummingbirds and butterflies. Salvia darcyi prefers low humidity and full sun. If it is grown in the shade, it will lean and stretch toward the light. It will grow in USDA hardiness zones 5b through 10, and can survive winter temperatures that drop as low as -15 degrees Fahrenheit. Salvia darcyi prefers loamy soil, but will tolerate clay. It should be given regular, deep irrigation, but do not overwater. The plant is fairly drought tolerant. Because it can survive on reclaimed salty water, it is often planted near golf courses. Apply a balanced, soluble fertilizer at half the rate recommended on the label every two weeks during the growing season. Mix time-released, balanced fertilizer into the potting soil when you plant your Salvia darcyi. Aphids, mealy bugs, snails and spider mites are attracted to Salvia darcyi; it is susceptible to fungal diseases including leaf spots, powdery mildew and stem rot. When planting, place the plants far enough apart to ensure good air circulation.